Looking back, at first glance it's easy to dismiss the early seventies as a musical wasteland, but looking a little more closely maybe the era wasn't quite the musical disaster area you might have thought. Those years between the late sixties when there seemed to be a classic new single every few weeks and a landmark album every few months and the burst of energy that accompanied the punk/new wave explosion around 1977 did, after all, introduce me to many of the artists who've become part of Hughesy's subsequent musical landscape, including The Band (though Music From Big Pink fits in as one of those late sixties landmark albums), Little Feat, Randy Newman, Neil Young, Bruce Springsteen and Steely Dan (back when they were a quirky poppish band rather than the super-slick Gaucho era). Much of my own musical ennui through those years resulted from changes as the old crowd I'd hung with moved out of town. Had I been able to find replacements things may well have presented a different aspect in hindsight's 20/20 vision. It was a time when there was plenty to read, quite a bit to listen to, and the odd item to watch on TV, even in a remote outpost like Townsville. The problem was that people to talk about these matters were thin on the ground. With plenty of reading matter but a limited budget, a couple of friends with similar musical interests would have been rather handy. The mainstream music press (the British weeklies, as well as the fortnightly Rolling Stone and monthlies like Let It Rock and Creem certainly threw up more than the odd new name to investigate, but when it comes to the monthly magazine the best of them was probably ZigZag. It wasn't always easy to find, and it was well after the magazine's first flourish when I finally tracked one down, and while I scoured the shelves in a number of newsagencies I suspect I missed the odd copy here and there along the way. 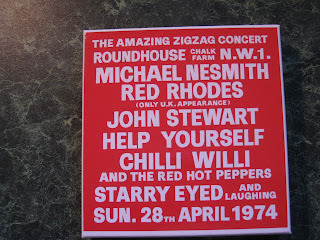 Those memories came flooding back as I worked my way through The Amazing ZigZag Concert, a five disk set featuring performances by Michael Nesmith, John Stewart, Help Yourself, Chilli Willi and the Red Hot Peppers and Starry Eyed and Laughing from The Roundhouse in London on 28 April 1974. Started by Pete Frame in April 1969, ZigZag was a classy monthly featuring in-depth interviews, comprehensive articles, as well as the earliest of Frame's immaculately researched Family Trees which remain the best source of who did what when back in the day it's possible to find. While there was plenty being written about rock music at the time, most of it tended to focus on the usual suspects, and given a lack of reading matter that coincided with his tastes Frame decided to provide his own. The magazine's name referred simultaneously to Captain Beefheart's Zig Zag Wanderer and a popular brand of cigarette papers. It wasn't, however, the sort of magazine that was going to attract a wide readership, and the financial wolves were never far from the door until Charisma Records' Tony Stratton-Smith came to the rescue in early 1974, which was around the time that copies started appearing in Townsville newsagencies. Stratton-Smith also came through with the funds that allowed The Amazing ZigZag Concert to celebrate the magazine's fifth birthday to go ahead. From the opening set by Starry Eyed and Laughing, the five disks in this package sent me back into a warm nostalgia that was surprisingly at odds with my actual recollections of the timeframe involved. Second up, the set by Chilli Willi and the Red Hot Peppers didn't hit me as well as the studio Bongos Over Balham did, but, hey, this is live and Bongos is one of my most treasured musical pieces of nostalgia, Still, it's always good to hear from an old favourite, and this was a very classy, if short-lived outfit. I'll be looking for Kings of the Robot Rhythm and the I'll Be Home compilation. Ex-Kingston Trio member John Stewart surprised a lot of people with Gold in the late seventies, but his set here is a reminder that the guy was a more than decent songwriter (viz. the versions here of Daydream Believer, Armstrong and July, You're A Woman, none of which I recall associating with Stewart as a writer). It's another set that underlines the quality of what was out there waiting to be noticed while some of us were looking for the next big thing, and there was another timely reminder of things I'd missed first time around in Help Yourself, another outfit firmly oriented towards the West Coast, with four extended jams making up the almost hour-long set. 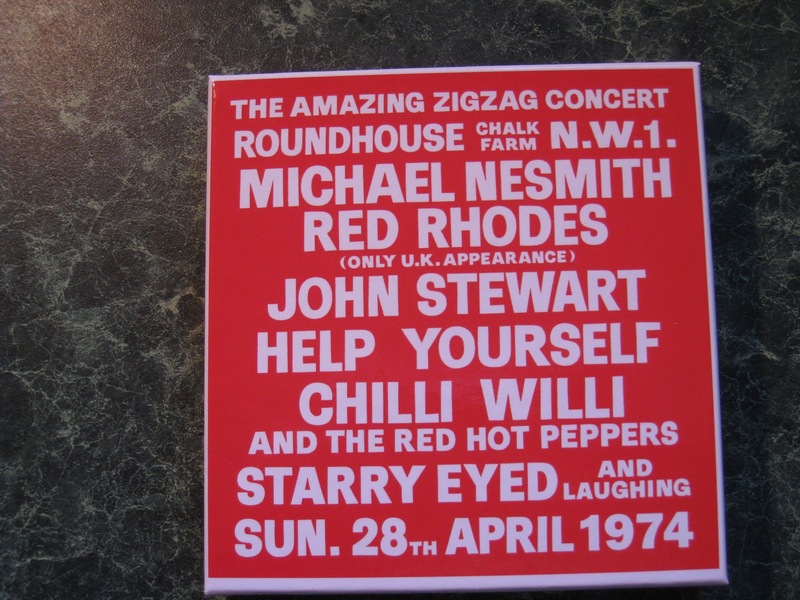 But if you're looking for something rather wonderful, I'd point you to the closing set by ex-Monkee Mike Nesmith and pedal steel player Red Rhodes. While Nesmith was certainly no stranger to radio airplay, particularly with the rather whimsical Rio, most of his catalogue slipped by under the radar, and once the opening Joanne and Some of Shelley's Blues are out of the way we're into unfamiliar territory that'll need to be investigated further. Quality writing, warm vocals and Rhodes' pedal steel is simply stunning. While what's on offer here is probably not much more than a footnote in the big scheme of things it's worth investigating if you've got the interest, the readies and you're quick enough on your feet to snaffle one of the remaining copies from the run of 2000 boxes from http://www.rgfrecords.demon.co.uk/ (£39 if you use PayPal, £2 credit card surcharge). It has certainly laid out a few more avenues to investigate. Musical wasteland? I think the early 70s was a great time with many artists from Bowie to Black Sabbath, BJH to Kevin Ayers releasing their best stuff. True, but what I was talking about was the inclination to look back and say "That era was pretty duff" without thinking about what was actually in there. After the glories of the years from '65 to '69 most eras would pale by comparison. And it's all about where you were at the time, what you were doing and what you could access, innit?